Starting in 2007, the GGN station located in Brewster, Washington underwent a series of equipment upgrades including: installation of an Ashtech receiver running the latest firmware, CQ00, and installation of a new 2U rackmount computer running Fedora 4. After three years, this rackmount computer failed and a new, Acrosser computer running Fedora 9 was installed. Early in 2010, the Brewster station started experiencing gradual degradation in the stability of the clock as realized via the GPS receiver. In an effort to find a solution to this problem, the Brewster station was upgraded with new antenna cables. In addition, the three existing cables feeding a 5MHz Maser signal to the Ashtech receiver were replaced with new cables. To finish the upgrade of the Brewster station, a site visit was scheduled for 11-17-2010. The trip was scheduled in order to trench the exposed antenna cable, and to search for additional noise producing equipment near the Ashtech receiver and along the path of the Maser signal cable run. Nearby power adapters and network hubs were moved away from the receiver, leaving at least two feet of space between the receiver and any nearby electrical equipment which could possibly be generating noise or interference. Lastly, the relocation of the GPS equipment to another room in the building was discussed. Currently, the Maser signal is delivered through two bulkheads and three different length BNC cables routed under the floor. Moving the GPS equipment to the room adjacent to the Maser room would eliminate one bulkhead and one of three BNC cables. Further collaboration with the station operators is needed in order to find a suitable power source for the equipment as well as a suitable location in the adjacent room. If the GPS equipment is moved to the adjacent room, high quality cables, such as the Phasetrack II made by Times will be ordered and installed. This particular cable is phase stable and will hopefully improve the quality of the clock solution and signal as seen by the GPS receiver. Figure 1 - The Brewster antenna monument lies on the other side of the fence of the NRAO grounds, but within the property line. 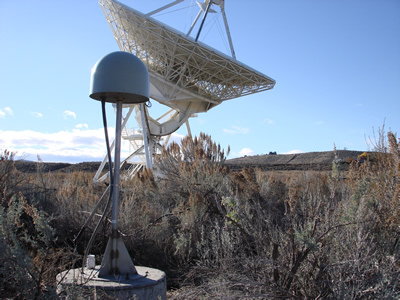 The antenna is surrounded by sage brush. 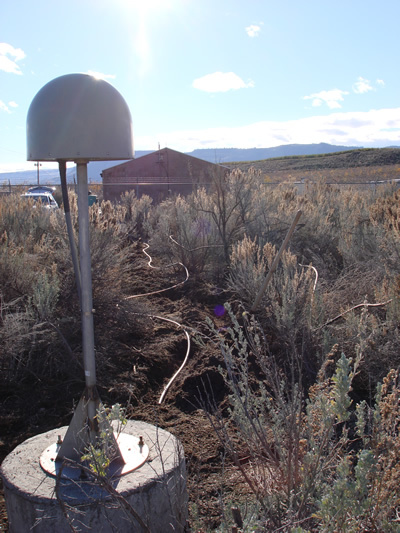 Figure 2 - A path was cleared through the sage brush leading up the monument to allow for room to bury the antenna cable.